The small gated community on the beach where this villa is situated is calm and peaceful, and the few quiet roads are home to fashionable private properties set in their own landscaped grounds. This villa is approached through large wooden doors into its entrance garden, where a stepping stone pathway leads on through the tropical foliage to a covered staircase going up to the house. Once at the top there is a balcony from which to enjoy the tremendous views over Bophut Bay. Designed in an L-shape around the infinity edge pool and its adjacent terrace, the villa's two pavilions contain the living and sleeping areas. Each room is air conditioned, the sitting room and all three bedrooms have TV/DVD/CD systems, there are personal safes in each bedroom suite, and the whole villa enjoys complimentary Wi-Fi Internet access. The living room and the two ground floor bedrooms have full-length glass windows and doors. Although the exterior of this villa is quite spectacular, the interior décor, furnishings and accessories set this holiday villa apart. Cool white walls, creamy sofas and chairs, natural woods, tiles and stone, and a subtle profusion of colour coordinated furnishings, accessories and wall art appeal to the discerning eye. 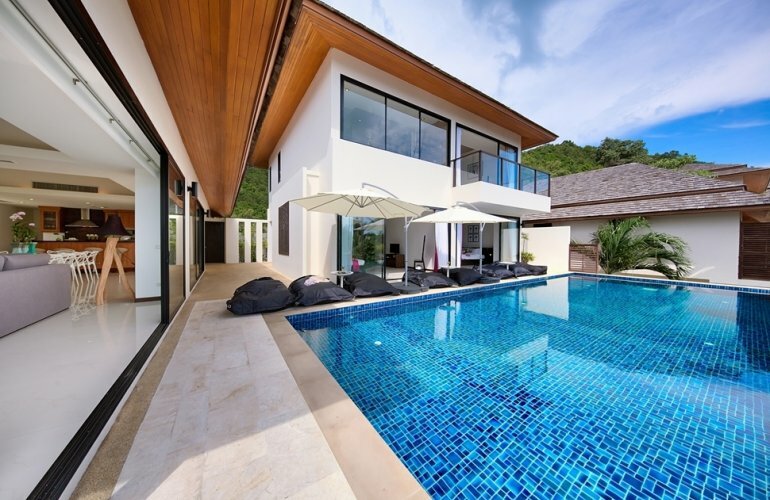 The open plan living room and kitchen are to the left at the top of the staircase, and to the right is a large sun terrace and the blue-tiled infinity edge pool, with the bedroom pavilion on the other side. In the living room, the sofas and chairs are large and comfortable and between them is a dark wood antique coffee table. The television is wall mounted facing the seating, and below it is a teak cabinet. Brightly coloured thick bamboo poles in huge vases, a gold a black coffee table runner and a tall driftwood lamp complete the setting. Central in this open plan living room is the large white high-gloss dining table, with six white high backed chairs. A further gold and black table runner runs along the centre of the table. On the back wall behind the table is a low fitted dark wood cabinet, with three wall-mounted large gold discs above it, each of which hold a central candleholder. To the left of the dining table is a door leading out to a charming private garden. At the far end of the living room is the kitchen, which is western styled and fully fitted. There is an island feature between the dining room and the kitchen proper, which makes a very good breakfast bar at which those early risers can take their first cup of coffee or tea. The wooden kitchen cabinets are topped with black work surfaces and all appliances are high quality chrome. A beautiful mosaic vase of black and gold holds a flourish of black feathers, introducing the black and gold theme to the far end of the living area. Behind the kitchen is a guest bathroom. The front of this whole open-plan room enjoys stupendous sea views through the large glass doors and windows that lead out to the pool terrace. Entering the sleeping pavilion which runs along the other side of the pool there is a hallway leading to two ground floor bedroom suites. Both have large sliding glass doors opening onto the pool deck and the views. The first room has built-in wardrobes, a flat screen TV, a personal safe and twin beds. There is a blue, gold and umber theme to the accessories, furnishings, rugs and the wall art, which continues into the en suite bathroom, which has white walls with blue mosaic tiles, dark wood units and a large walk-in shower. The second bedroom is the mirror image of the first, except that it has a double bed, and the colour scheme is tones of deep pink, lilac, purple and gold. The en suite's mosaic tiles are lilac. Stairs from this pavilion's hallway lead up to the first floor level where there is a private lounge, and the master bedroom suite. The beautiful and comfortable sitting room is at the top of the stairs, furnished in bright red with red and gold paintings and dark wood furniture containing an interesting collection of artefacts. A ceiling fan wafts a gentle breeze downwards. The master bedroom consists of an office area to the left, a walk-in dressing room, a large romantic four-poster bed with fine white muslin drapes, a personal safe and a flat-screen TV. There is a feature oversized bamboo love seat with cream upholstery from which to watch the television. This room has its own balcony overlooking the pool and the stunning views associated with this property. The en suite has natural stone floors, offset with aquamarine mosaic wall tiles and dark wood. Twin hand basins rest on a dark wood base and as well as a large walk-in shower, this bathroom features a white bathtub sunk into a wooden base set in front of the windows, giving views straight out to sea.